For Lan Turner, the Fibonacci and Elliott Wave Tools have become his favorite analysis tools for his personal trading. He is now making available this in-depth educational course to help you gain an intimate understanding of how to effectively apply these amazing tools to your investing strategies! What Do Fibonacci Numbers Have to Do with Trading? The Fibonacci Ratio is found throughout nature and the universe. In Track 'n Trade we apply these ratios to the markets in order to help us identify price retracements based on Time and Price. When you apply the Fibonacci Ratios as a Technical Analysis Tool it can help map out likely retracements. You can then project where the market may be headed with the Fibonacci Time Zone Tool. Similarly, the Elliott Wave is also a recurring market pattern. Track 'n Trade software provides tools to help the investor analyze the market for these patterns. This course will teach you how to identify the Elliott Wave in the markets and how to project it out into the future. 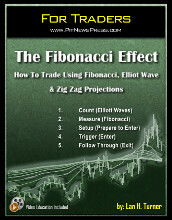 Once you have learned to identify Elliott Waves, you will then learn the power of it when it is used in combination with the Fibonacci Technical Analysis Tools and the Zig Zag Indicator. Once you have learned to identify the Elliott Wave in a chart, the Zig Zag Indicator can increase the effectiveness of this technique. This customizable tool helps you automate this process and gives you the ability to "tune" this indicator to different types of markets. All Courses and Material offered are intended for educational purposes only. They are not a recommendation to buy or sell any particular financial instrument. There is risk of loss when trading stocks, futures, or forex; see full risk disclosure.